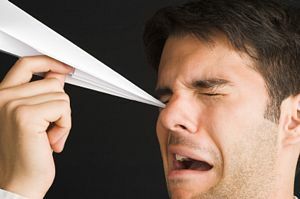 Causes: being poked in the eye, rubbing the eye when there is a foreign object in it. Symptoms: pain, foreign body sensation, tearing, sensitivity to light. What to do: Do not rub or patch the eye. Seek medical attention immediately (eye doctor, emergency room, or urgent care center). Scratches make the eye susceptible to infection, especially if whatever scratched the eye was contaminated. Infection can cause serious damage in as little as 24 hours if untreated. Causes: Eyelash, metal shard, wood splinter, sand, dirt, or other foreign body on the surface of the eye. Symptoms: Sharp pain, tearing, burning, blurry or decreased vision, difficulty opening the eye. What to do: Do not rub the eye if you suspect something is in it, this can scratch the cornea. If you believe the object is metal, seek medical attention immediately. Metal particles rust quickly and can cause scarring. 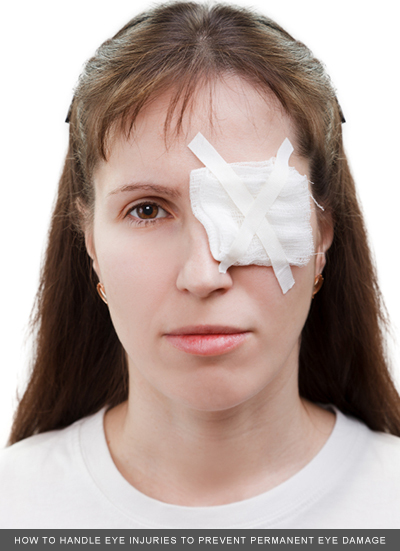 Otherwise, flush the eye with a large amount of saline solution (if available), distilled water, or tap water. There are several ways to do this. You can hold a glass of water to your eye and then tilt your head back, or you could cup your hands under running water, put your face in it and open the eye. You could also let water run into your eye in the shower, or from a garden hose if you are working outside. If flushing the eye is not effective, you can try gently removing the object with the tip of a cotton swab or tissue, if you can locate it. Be careful not to scrape the cornea while doing this. If after the object is removed you continue to experience pain, tearing, and/or a foreign body sensation, seek medical attention immediately. You likely have a corneal abrasion, and this must be treated to prevent infection. Causes: A foreign object being poked or propelled into the eye with enough force to penetrate the surface. Symptoms: Object visibly protruding from the eye. What to do: Seek immediate medical attention at an emergency room or urgent care facility. Do not touch the eye or make any attempt to remove the object yourself. If possible, loosely tape a paper cup over the eye for protection (assuming the object is small enough to fit inside). Causes: Being struck in the eye by a blunt object, such as a fist or a baseball. What to do: Apply an ice pack to reduce swelling. See an eye doctor as soon as possible to make sure there isn't any internal damage. Symptoms: Blood in the white part of the eye, sometimes spreading over the entire eye, turning the sclera bright red. No pain, no vision loss, no blood in the iris/pupil area. What to do: Treatment is not required, and the blood will clear by itself over time. It may be several weeks before the eye appears completely normal again. Important: do not confuse this harmless condition with a more serious condition called hyphema (bleeding in the eye's interior, see below). Causes: Significant blunt force trauma such as being punched or kicked in the face, or being hit with a baseball or hockey puck. Symptoms: Blood pooling in the iris/pupil area of the eye, sometimes spreading into the sclera (white). What to do: Seek medical attention immediately.